Get 50% Off Tickets To Thursday Nights Game! 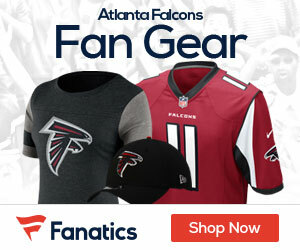 We’ve decided to partner with ScoreBig to offer our readers Falcons tickets at great prices! ScoreBig is the new, members-only place to get great deals on sports, concert and theater tickets. With thousands of available seats from the floor to the rafters, every ticket is below retail price, fee-free and 100% guaranteed. Browse their sports, concert and theater selection. Select the event you want to buy tickets for, then select a seating area and tell them how much you want to pay for the tickets. You will never pay more than your accepted offer and tickets are always below retail price. It’s similar to Priceline, but for sports tickets. And all of their tickets are discounted 10-60%. 1. Every ticket is below retail price. 2. Members decide how much they want to pay for tickets. 3. They never charge any fees. The amount of your accepted offer is what you pay. 4. Ticket delivery is always free. 5. They back all of their tickets with their 100% guarantee. 6. They’ve got tickets for every budget, in every section of the house. 7. Sports Gab Network readers can bypass the wait-list by using the link below. 8. Their prices make it possible to try new things and get out more. 9. ScoreBig is a great way for families to have fun together. What are you waiting for? Sign up today and check out the great deals available for you today!